The split of the Russian Orthodox Church and its aftermath: this is the subject of the new program "Twelve" by Sergey Shargunov, writer and journalist. This is Sergey Shargunov and the program "Twelve". Twelve minutes about what bothers me. There's little time: the talk will be plain. For me, this topic is not leisured or just informative but personal: as I'm a son of a priest, my heart feels the schism. The Holy Synod favored the unity of the Russian Orthodox Church on its canonical territory. Christianity is about love, not about hate, hostility, and fratricide. The current split of the Church in Ukraine can only lead to the further escalation of hostility. The church conflict, started during the civil confrontation and war, may lead to a new, bigger bloodshed. Exultant Poroshenko, Bartholomew, acting pharisaically, mischievous Americans. All that is to split Ukraine from Russia, to turn it into "Anti-Russia". In order to do that, they ban the symbols of the Victory in the Great Patriotic War, banish the Russian language, and just for that purpose, they now decided to destroy the Moskal church. But is the Moskal Church so great? Most of the Ukrainian parishes, more than 12000 people, chose to stay in the United Russian Orthodox Church. Now, those parishes will be seized, just as they have been seized all the time, especially in Western Ukraine. Just like in Estonia, in the 90s, with the blessing of Constantinople, and with the assistance of the local authorities, our churches were taken away. Just like in the early 20th century, when Russia was weakened by the civil war, Constantinople started to support the schismatic Renovationists, who were basically theomachists, to spite His Holiness Patriarch Tikhon. What if there's an assault of Kiev Pechersk Lavra tomorrow? It was guarded by the police before but now they can join the assaulters because the President of Ukraine isn't going to remain neutral as the law demands. He interferes the inner-church life boldly and rudely, uttering bellicose statements about the victory over the wrong believers. This is the Trinity Church in Vorobyovy Gory. Father Andrey Novikov serves here. He had to flee from Odessa. - So, to violate the Seal of Confession? Yes, to tell about the ones who go to remonstrative rallies, who are dissatisfied with the authorities. They said it was for their benefit, to keep them away from the unnecessary actions, which they can commit and harm themselves. Listen, that's just nonsense, that's unacceptable. The canonical Orthodox Church of Metropolitan Onufry gathers thousands of people for huge religious processions for peace. This cannot be forgiven. You can hear the pain for the division of people and the truth about fratricide in Onufry's words. Metropolitan Onufry: “On the basis of war, blood, nothing good can be built. Therefore, the church calls for people to find the strength to forgive each other and to stop killing each other. This is not today's position of the church. It said it always — in 1917, at other times when there were such wars". Here's "good" pastor Filaret who once praised the CPSU, and now convinced that people of Donbass must atone for the wrong vote with blood. "Oh God, why?! Why did you kill my child?!" - Filaret's Church is purely nationalistic. Andrey Novikov, archpriest: This is not nationalism, this is unadulterated Nazism. One of the simplest methods of taking away churches, monasteries, and lavras, the same that was used in Estonia, is the new law on freedom of conscience and the re-registration of charters of religious organizations. Then everything is officially handed over to the right people. Everything is taken away from the former church. But since someone's itching for a fight, the aggressors are likely to rush to the force-based scenarios. Once, President Yanukovych, wanting to score points, began to play with the conflict topic of European integration. Ukraine got such a concussion, it has been living like on the top of a volcano. Now Mr. Poroshenko, taking care of additional votes in the upcoming elections, decided to wake sleeping dogs and to unleash the religious strife. Who knows what catastrophic consequences this may lead to what territories the unrest may lash on. True, the southeast of the country is the so-called Moskal parishes. - Are there Filaret's parishes in the southeast of the country? Andrey Novikov, archpriest: Yes, though there are few of them. They're empty. Only a few people are visiting them. Do you know what the problem is in Odessa, Nikolaev, Kherson Oblasts? 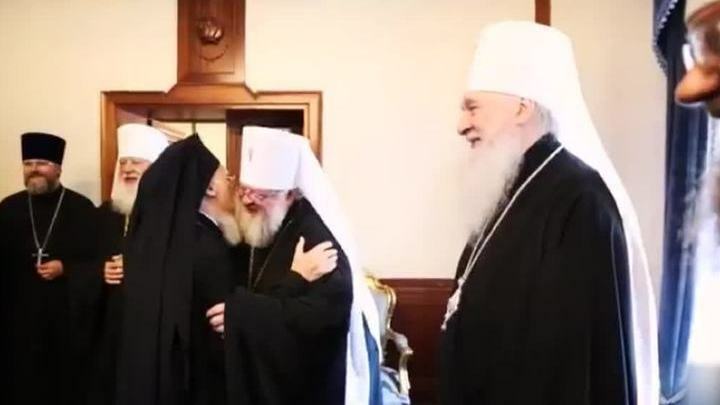 When I was in the Odessa eparchy, I clearly remember where the schism is. There's not much of it, but still. It's on the border of the Odessa, Nikolaev, Kherson oblasts, where there are immigrants from Western Ukraine who were resettled in Stalin era. There is schism but not everywhere. Most of the churches are loyal to the canonical Church. There are former Uniates who are loyal to the Orthodox Church nevertheless. They aren't going to convert. Even there it is not so simple. In general, what's going on is logical. One can say the spiritual advancement of NATO is taking place. Andrey Novikov, archpriest: “See what the patriarch of Constantinople did. He had another option. He could set up his own metropolitanate, start accepting schismatics there, reconsecrate them or something like this. Gradually, he could come to the separation. But he started with the toughest stage. The decision was made in such a way the Russian Church had no option to mitigate the situation. Yes, it could either obey or separate. Other churches have to choose as well. Maybe it won't be a direct rupture. Our church will demand that they will define their position. I think all of this is conducting the policy of the US State Department and the United States in general". Politics has interfered in the spiritual realm. There has been a geopolitical redistribution. Quite soon, the Moscow Patriarchate will possibly lose churches in Belarus, Moldavia, and Kazakhstan. There will be separate nationalist churches. It's already happening in fact. If the Patriarchal Charter of 1686 on the transition of the Kiev metropolitanate under Moscow is canceled, then the cancellation is applied to Belarus as well. Bartholomew, sitting in Istanbul, said all Ukrainian Orthodox shall submit directly to him only. He simply annexed the spiritual realm of the Russian world. All schismatics denounced by Moscow are recognized and supported. It's logical to expect the list of the blessed will enlarge. For example, we remember the White Brotherhood sect that carried out a rehearsal of Maidan in the very heart of Kiev. Hundreds of zealots almost died then. Sorcerer Gagik Avakyan can be recognized as the new head of a new church. This is the way he protects Filaret. Gagik Avakyan: "Bless my brother for further service, heavenly father, bless his hands, his mouth, so that he may praise you, Glory to you, thanks to you". The decision to support the schismatics ominously coincided with the arson of the Church of the Softening the Evil Hearts in Moscow. At night, the masked malefactor doused the temple and Sunday-school with flammable liquid and set fire to it. Fortunately, for the most part, the temple was saved. But the church's outhouse and the school were destroyed. Fedor Yanovsky, priest: "You see the fire came to the gates. After that part, the church itself begins. Everything here is burned but the church remained intact." This coincided with the schism. To the parishioners' due, they started restoring the church the next morning after the fire. Fedor Yanovsky, priest: "We had service yesterday despite the accident. The Vicar Bishop came to support us". Indeed, anyone could set it on fire because of the idea or a mental disorder. But believers know that all the providential is symbolic, especially when the shrine is encroached upon. Instead of softening, evil hearts harden. At the same time, the hearts of Christians start burning with ancient fire. If necessary, they will go to the Odessa catacombs, to the underground caves of the Kiev-Pechersk Lavra, but they will never betray their Church. The historic earthquake is going on. Tectonic plates are shifting. Ancient sacred texts are revised. The ancient story of the persecutors and persecuted is resurrected. Twelve It was the program "Twelve". Twelve minutes have passed by. See you soon.